NNCW is an annual week of educational activities started by GLSEN aimed at ending name-calling of all kinds and providing schools with the tools and inspiration to eliminate bullying in their communities. At the Museum of Tolerance we are marking the week with 5 ideas and related actions for positive change. January 20, 2014 is MLK Day of Service reminding us of the courageous heroes of the civil rights movement who changed this country and still inspire us to speak up for what we believe today. The Museum of Tolerance invites you to celebrate important legacies through a theatrical performance of Living Voices: The Right to Dream at 1:30pm and 3:00pm and a screening of Lee Daniels' The Butler at 6:00pm (included with museum admission, free for members). Register onlineto reserve a seat. Did you know that 20% of students report experiencing bullying and in some parts of the country the number is as high as 40%? Organizations like GLSEN share important research and guidance to help people better understand bullying and its consequences. Go to www.nonamecallingweek.org to learn about the problem, identify solutions, and download free school anti-bullying planning guides, a student survey, reading lists, “No Dissing” stickers, and other resources. See the winners of the student creative expression contest! Everyone has the power to play a part in ending bullying. We can all be supportive players by not condoning it, being an ally to others, and speaking up. The Museum invites students to meet Karlee Roberts for a discussion on youth empowerment and uniting together to end bullying. 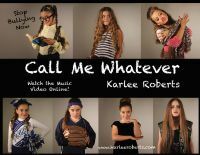 Check out her video "Call Me Whatever" and join her in "getting her geek on" to promote anti-bullying awareness. No Name Calling Week is about ending trash talk and promoting good talk. Draw Your Line is a place where MTV is spotlighting the ways in which young people are taking action to stop digital abuse (sexting, textual harassment, cyberbullying etc.) While you're there, you can also find and suggest resources while discovering new ways to draw the line between digital use and digital abuse. Delete the bad and spread the good! Experience the Museum of Tolerance’s programs and exhibits including the POV Diner bullying scenario and be part of an ongoing movement for change. See featured speakers at the MOT such as Hate to Hope presentation- today- or on the first Sunday of every month to learn a powerful story of hate, forgiveness, and reconciliation. Like us on Facebook to stay connected! The Museum of Tolerance offers programs on anti-bullying every day and will continue to add resources throughout the year. Learn about our programs.